Tidy piles of rubbish line the north-eastern Japan coastline where there used to be towns. The question is, what can you do with so much stuff? The tsunami which hit Japan’s coast on March 11 last year destroyed houses, shops and entire communities, condensing it into more than 22 million tons of debris. To get a better picture of how much that is, it would take the people living in north-east Japan a decade to generate the same amount of household rubbish. Just before the one year anniversary of the Japan’s devastating earthquake, tsunami, and nuclear disaster, I had the opportunity to go up north to see the place for myself. Around sea level, everything had been wiped out. From time to time you could see the giant piles of debris, all organised into different piles like steel, wood, cloth, and so on. I had recently read a story in the Japanese newspaper Asahi Shimbun about what was going to happen to the rubbish, which I thought was worth sharing. Firstly, anything in good condition will be recycled. Wood can be re-used to make furniture, and glass or aluminium can be used to make parts for new refrigerators and TVs. Anything that cannot be recycled, like old clothes, will be burned. Some debris, however, will be buried to help create an anti-tsunami barrier. They’re called é˜²æ½®æž— (Bochorin), and it refers to forests grown along the coastline which will help protect inland towns from tsunamis or other sea disasters. By breaking up concrete debris and burying it in the ground, the debris acts as a platform and allows the trees to be planted higher above sea level. It’s not the first time such forests have been made either. Back in 1923 when a lot of the Tokyo area was destroyed by the Great Kanto Earthquake, debris was broken up and buried to make a seaside park. 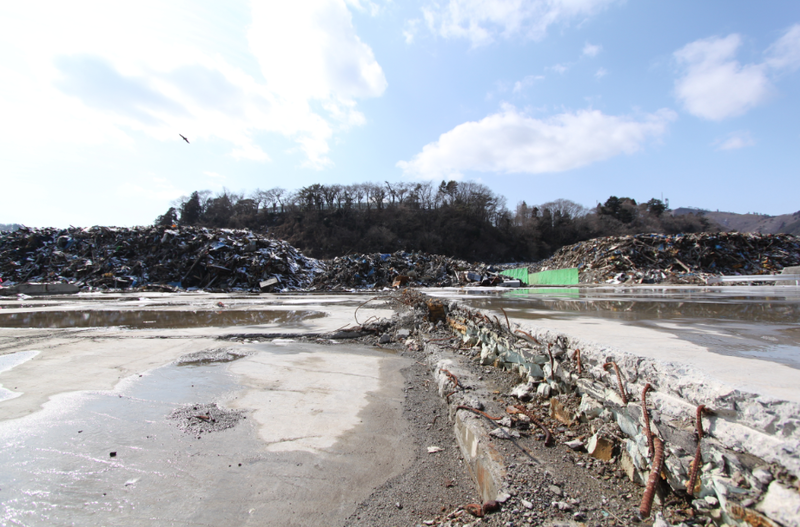 More recently, up to half of the debris resulting from the 1995 Kobe earthquake was buried in the harbour too. Work is expected to start on Sendai’s version in June. The last concern is about radiation. At the moment the Japanese government has said anything with a reading below 1000 becquerels per kilogram for radioactive cesium is safe to re-use. Fukushima prefecture is an exception, where a 3000 becquerel per kilogram limit has been set for concrete which could be re-used to make roads. In a different way this reminds me of Seoulâ€™s â€˜garbage mountainsâ€™, that have been made in green areas near the city from what Iâ€™ve read. Great to hear itâ€™s being put to positive use. One grump Iâ€™ve heard about Christchurch demolitions is that features of older houses are not always (not often?) being salvaged. In Japanâ€™s case I imagine there is little option, the houses being considerably worse off.